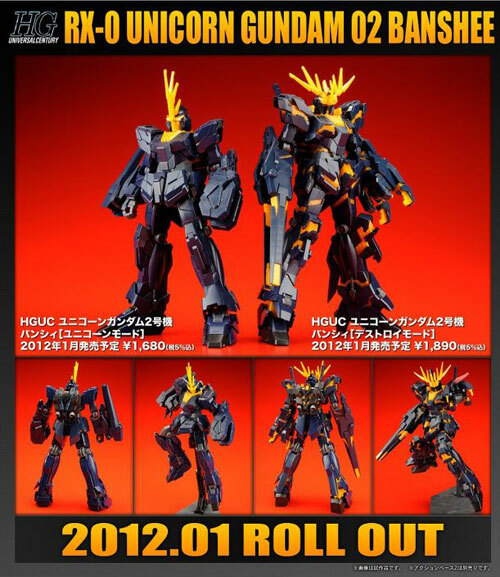 March 2012 – Golden MS HGUC 1/144 Delta Gundam! Gundam Unicorn (UC) Episode 5 Promotion Video! Gundam UC (Unicorn) ep 5 8 Minutes Preview Video! I don’t remember seeing those weapons in the novel. Wonder if they’ll appear in the anime. Looking at this, I have to eat my own words of not buying the Banshee. The question now, is whether I should get the HG or MG (future release) to complete my other 2 Unicorns. MG is too price but HG does not really complete the MG size. A real dilemma here for me. I feel that the yellow piece on top of the chest looks real awful in normal mode (the yellow face piece as well) but is fine on Destroy mode. They should just stick to the original color scheme in the novel for normal mode, everything is black except the horn. The claw looks real similar to Shenlong Ver. Ka design. Which version will you be planning to get, HG or MG? And will it be one or two Banshees for you?